Thanks for following my blog. Nice photo. I like the flowers in the hand. Is this your Grandmother? Thank you very much about you nice words.I hope to visit us again we will have new pics about everyday. She is absolutely lovely. Grandmothers are the best. i love your grandmother, and this photo is impeccably lovely. i love the greek civilization! Thank you for following me. Nice to meet you. Best Wishes. I look forward to seeing more of your work. The beauty of elderly is so often overlooked. She is stunning. What a wonderful picture! A lovely lady among lovely flowers. Beautiful. Beautiful… and such texture and character! The grandmothers and grandfathers in Oaxaca are some of my favorite subjects. Many thanks for following my blog. Thanks for liking my blog. I’m happy to follow yours. I’m Australian born but of Greek heritage – the heritage can be lost very easily if you let it. 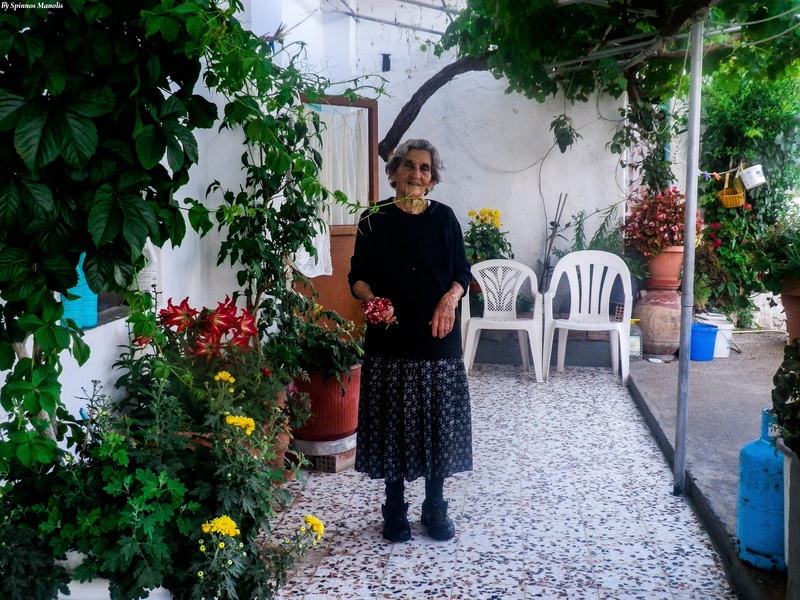 memories of my yiayia…lovely photo! Lovely lady with a beautiful smile and one gorgeous patio. You have captured true beauty and warmth. I love her! What a darling person. Thank you for doing such beautiful work. We thank you cause you visit our blog and for your nice words! I just nominated you for a Versatile Blogger award at niasimoneauthor.com. THANK YOU very much we appreciated! Thank you for checking out my blog, http://www.lostinsiouxland.com. You three have a very nice blog here. Wonderful people photos. And the weather looks splendid, although I am a four season kind of person. Enjoy the sun and surf and keep up the the wonderful work. Thank you for stopping at my blog and following! I’m very new at WordPress and really appreciate your interest. Lovely grandmother! !